We have described our Apple essential oil and how it can enhance your lifestyle below. Apple: Apple is one of our appetite suppresants; however, you must like the smell for it to be effective. They have discovered through case studies that when you smell something yummy to you, it tricks your brain into thinking you've eaten that food. Most of our customers smell the Apple 5 times right before they eat their meals in order to reduce their portions. We do have some customers who actually sleep with the Grapefruit (another appetite suppressant) open in order to help curb their midnight snacking. 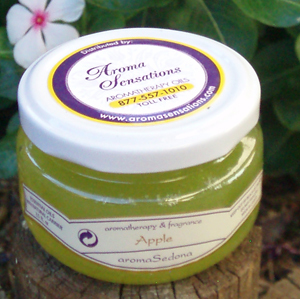 Apple can also be used as an odor inhibitor or as a moth repellent. Our best testimonial for the appetite suppressants is a gentleman who said he lost 23 pounds by smelling the Apple before every meal. You will not feel like you just ate an entire meal; however, because it takes away your hunger pangs, you aren't as ravenous as before & tend to make better choices and/or reduce your portions. Others choose to smell it between meals when they are prone to snacking, some leave the jar open on their desk the entire day due to "grazing" and some are TV snackers so they keep the open jar next to them on the coffee table the entire time they're watching TV.